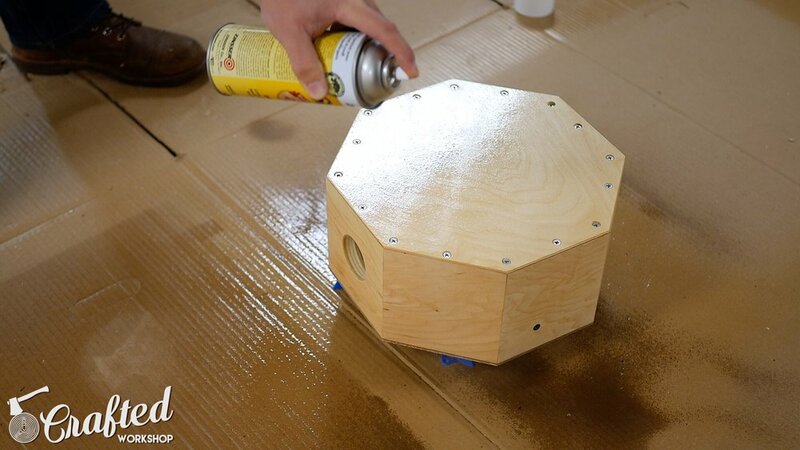 In this video, I build a wood snare drum / DIY cajon snare! This is a great project for adding a unique sound to your drum kit, and would also make a great gift for kids interested in music. Enjoy! 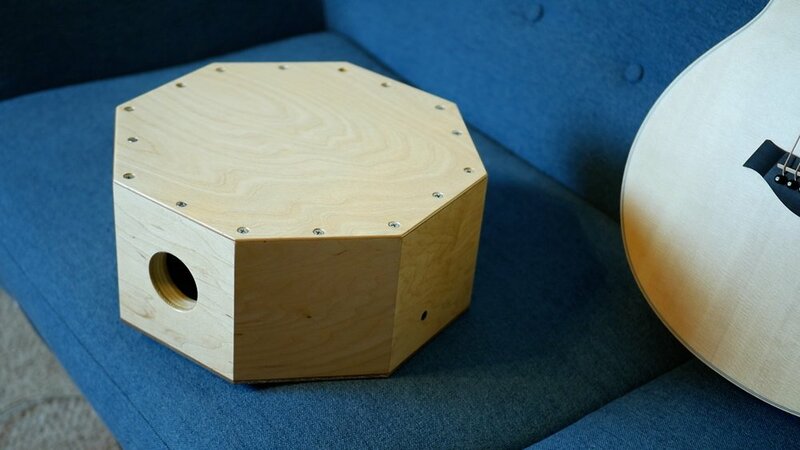 This wood snare drum is modeled after a cajon, a traditional Latin percussion instrument. 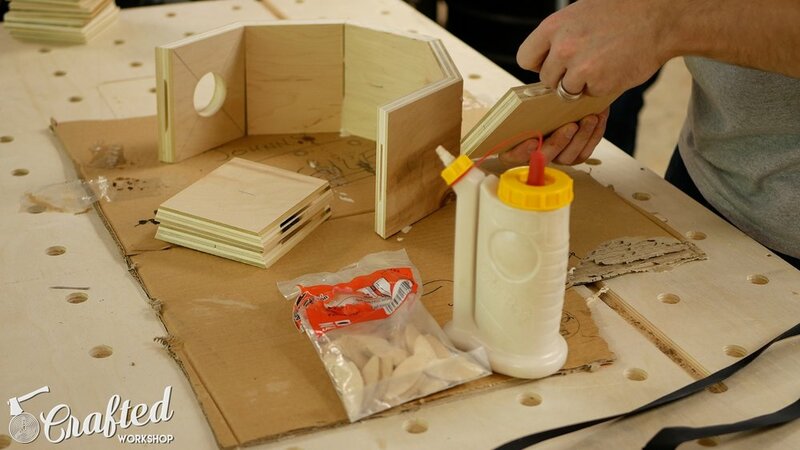 I used ¾” plywood for the sides, ¼” plywood for the bottom, and ⅛” plywood for the top. This was a really simple project, and is a great use for leftover scraps. I designed this to fit in standard snare drum stands, with a width of 12”. I started by building the sides of the snare. I used 5 ½” wide strips of ¾” plywood here. You could certainly use solid wood instead of plywood if that’s all you have available. I wanted a snare drum with a diameter of roughly 12”, give or take, so I cut my eight segments at 4 3/4” long. To cut the segments, I set my blade angle on the table saw to 22.5 degrees and used my miter gauge with a stop block to make the cuts. 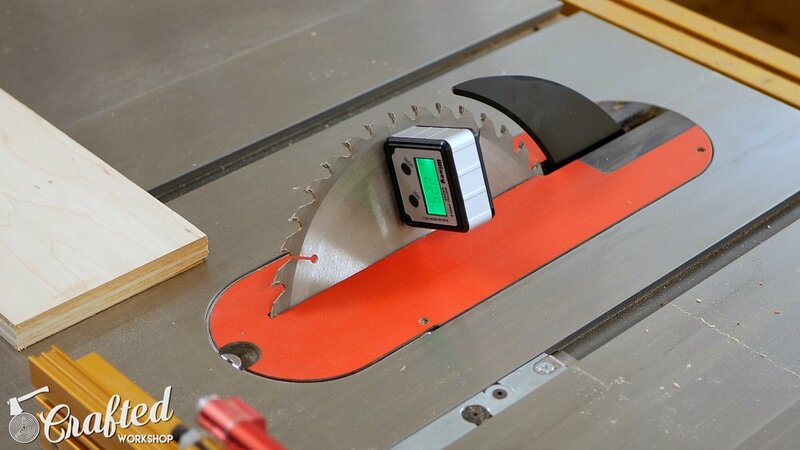 If you don’t have a table saw, you could cut the segments on a miter saw as well. Once the segments were cut, I put them together to make sure they lined up. After checking the fit, I cut biscuit slots into the pieces to help with alignment during assembly. The biscuits also give the snare some additional strength. I used #10 biscuits. Before gluing up the sides, I also cut a port into one of the side pieces using a 2 ½” Forstner bit. I did this at the drill press, but you could certainly use a handheld drill here. Next, I assembled the sides using biscuits and glue. The pieces came together great, with a tight glue line on all sides. I used one of these strap clamps, which was perfect for this type of glue up. After the glue dried, I cut the top and bottom pieces. I cut these on the bandsaw, but you could just as easily use a jig saw. I didn’t even really need to cut the octagonal shape, it just reduces the wear on the flush trim bit I use in the next step. I glued on the bottom, as it doesn’t need to be removable, and added some 1” screws. I also added clamps to make sure the glue had even pressure. The top is made using the same process, except I didn’t add glue. This is so that I can adjust the snare in case I need to later. After the glue dried, I used a flush trim bit on my router to flush up the edges. Once the snare structure was done, I got to work on creating a mounting bracket for the snare wire. First, I cut the snare wire in half. Next, I mounted both halves of the snare to a piece of scrap 2x4 that I cut in half at the bandsaw. Any piece of smaller scrap wood will work here. I screwed both halves of the snare wire to the piece of scrap wood, and then attached the snare setup to the snare assembly using a few screws from the outside. This allows me to adjust the angle of the snare wire to dial in the sound. Note: At this point, I realized that the ¼” plywood was too thick to produce a good sound. I remade the top using ⅛” plywood off camera, and it sounded much better. I sanded down the entire drum using 120 grit sandpaper and then rounded over all of the edges using an ⅛” radius roundover bit on my router. I finished sanding with 180 grit and then vacuumed any dust from the surface. For the finish, I first used two coats of spray shellac, sanded with 320 grit sandpaper after it dried, and then put two coats of spray polyurethane on top of the shellac. Once that dried, the snare was finished! If you'd like to see another DIY instrument project, check out my DIY guitar build series! If you liked this Wood Snare Drum / DIY Cajon Snare project, please give the video a thumbs up and leave me a comment letting me know what you’d like to see me build next. If you don’t already, get subscribed to my main channel and on my second channel. Last, if you want to support me more, use the Amazon affiliate links in the lists at the top of this post. This is a free way for you to support my future projects! Thanks and, until next time, happy building!